So I've decided to start a series here of camera phone photography all about bathrooms. People put some weird stuff up in there. Why is it important to look at artwork while you're taking a dump. Well, thisi what my mom chose. 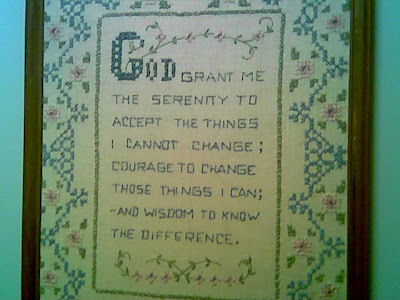 The Serenity prayer. What could be better to ponder while processing lunch?